Nice! 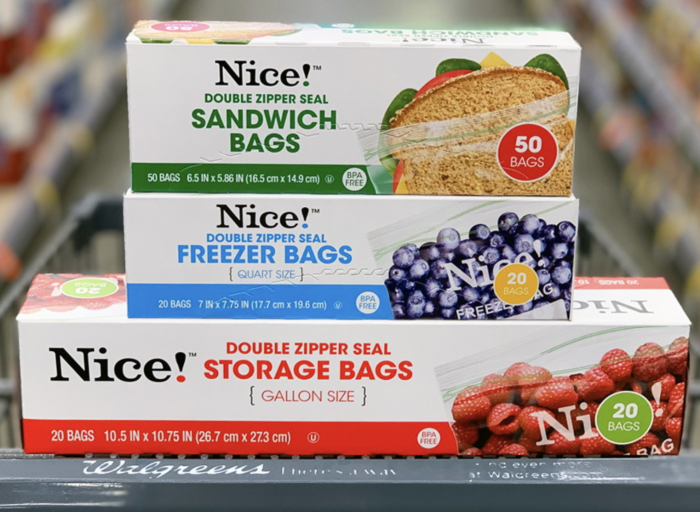 Sandwich, Storage, or Trash Bags less than $1 at Walgreens! Walgreens is having a buy one, get TWO free sale on their Nice! Sandwich, Storage, and Trash bags this week! Price will vary by store and region, but you should seem all of the Nice! products priced at or around $2.79 — making them just $0.93 each after the sale! Thanks for the deal info and photo, Krazy Coupon Lady! « L’oven Fresh Bread just $0.60 at ALDI! I use the Nice brand bags almost exclusively. I feel that their quality is excellent for the sale price! Their box has many more than the dollar store. The key is to stock up when they have a sale.